Inha University is one of the most prestigious private universities in Korea, and has been continually ranked as a top 10 college nationwide. Since its foundation as an engineering institute in 1954, the university has sustained a strong tradition of academic integrity and gained a reputation for excellent educational programs and research in the fields of science and technology, and across a broader academic spectrum including IT, social sciences, business, global logistics, education, law, fine arts, humanities and medicine. Motivated by the strong support and investment of the Hanjin Group, which controls the foundation along with Korean Air, Inha University continues to develop and enhance its education programs, practical research projects and globalization efforts. Inha’s vision continues with its grand project of building a global campus in New Songdo City, a newly emerging international business and R&D hub city in northeast Asia. Inha University annually offers a Summer School program as a part of its goal to a more enhanced global education. The summer program was first initiated in 2004 to provide overseas college students with hands-on opportunities to learn the Korean language and experience the cultural and academic life in Korea. Since then, the program has continued to develop and has been enriched with more unique and diverse activities, while attracting more participants every year. This short-term, intensive program mainly consists of classroom lectures, visits to corporate sites, cultural sessions and field trips to cultural and historic places in general. Through the coursework, international students will have opportunities to better understand the dynamic aspects of the past, present and future of the Korean society. One of the most important and engaging aspects of this program is that the learning is not limited to the classroom. Many field trip locations are themselves “living textbooks” for international students, who are eager to gain real world experiences on traditional and modern Korean culture. Throughout the program, international students will enjoy many chances to meet and interact with Korean students, and an opportunity will be given to make a presentation to share their experiences and views with each other. At the end of the program, participants will receive certificates of completion. In addition to learning about the Korean language and culture, students will also be able to take many other interesting courses such as East Asian Politics and Int’l Relations, Korean Society and Politics in the Films, Introduction to Korean Business & Economy, Language and Culture in Practice and Modern Technologies for the Future etc. These courses will cover theories at the introductory level, present diverse aspects in the chosen fields and include site visits to various off-campus places. The fields and scopes of the courses will continue to expand reflecting demands from students and the global community. This is an exciting opportunity to be part of one of the top universities in Korea and earn credits towards a degree at your home university in only three weeks. Inha University has world class facilities including a library, student center and dormitory. Inha University has close to 22,000 students. All summer school participants will have a Korean buddy who will help them to learn about Korean culture and practice Korean. A variety of unique Korean-related courses are offered to participating students. Students will have access to the support staff in the dormitory and the International Center as well as academic and other counseling services. Students will have lots of time to experience Incheon metropolitan city, which is one of the most dynamic and beautiful cities in Korea. Course Information: Students can expect outstanding teaching standards delivered in a warm and welcoming environment. Programs are designed to be interactive, stimulating and fun. Teaching involves a combination of lectures, classroom learning, self directed study and practical field trips. Application will be cancelled if payment is not made by the payment deadline. Registration cancellations received prior to the cancellation deadline may be eligible to receive a 50% refund. Cancellations received after the stated deadline will not be eligible for a refund. Invitation letters will be sent out after the cancellation deadline. Participants will reside in campus residential halls which are conveniently located within walking distance. Each room houses four students and students can use all the facilities including computer rooms, laundry facilities, shared kitchen and gyms and etc. There are also many restaurants and supermarkets nearby for students. Over the course of the three weeks, students will go on field trips specific to the subject they are studying. For example, students who study business may visit the headquarters of multinational corporations while students taking Korean culture class may visit the National Folk Museum or the Museum of Immigration History. All of these field trips will complement classroom learning. For more information, please visit official website: summer.inha.ac.kr. 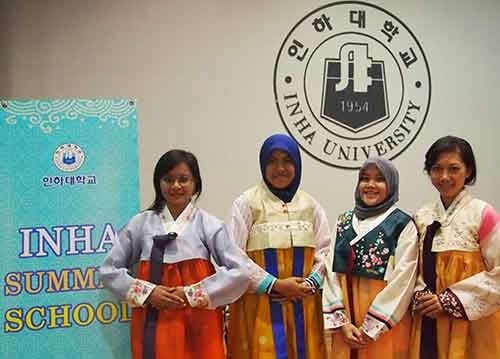 Demikianlah informasi mengenai INHA University Summer School, South Korea semoga berguna bagi anda.